Jonah Lomu is a rugby legend who will be a massive loss to the world and the sport, says former opponent and ex-Scotland forward Peter Wright. Former New Zealand winger Lomu died, aged 40 overnight. Wright played against him in the 1995 Rugby World Cup quarter-final - shortly before Lomu was diagnosed with a rare and serious kidney condition. "He was just something we had never seen before in the world game," Wright told BBC Scotland. "He was pretty unique in his physicality. "We had guys his size playing in the forwards, but we had never seen someone at 6ft 5in and 19 stone playing on the wing." Lomu, who twice helped New Zealand beat Scotland at World Cup finals - in the quarter-finals of the 1995 and 1999 tournaments - has been lauded as rugby union's first global superstar and someone who changed the face of the game. "They converted him from a number eight - he had played against France as a number eight and hadn't done particularly well," recalled Wright, 47. "But the coach decides 'why don't we try this guy on the wing' and they did that and he went down as a legend. "There are so many big physical guys now, but back in 1995, he was unique. "Thankfully, I wasn't directly up against him. I think that was [former Scotland winger] Craig Joiner's honour. "Jonah Lomu scored a try. I think it was the first try against us. He ran in from the halfway line, brushing off a number of attempted Scottish tackles." Indeed, Lomu scored seven tries in six Tests for New Zealand against Scotland, including a hat-trick in a 69-20 win in Dunedin in 2000, Scotland's record defeat by the All Blacks. Wright said the winger off the pitch was different from the powerful and imposing figure on the field. "Quiet, unassuming, actually quite shy. Just a nice guy," added Wright. "Off the park, such a gentleman and a massive loss to the world and the world of rugby." 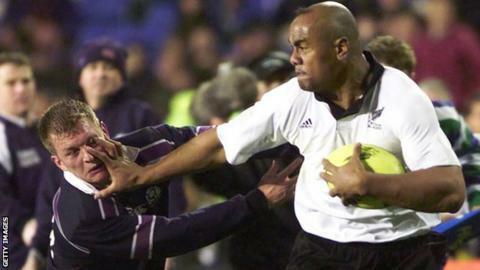 BBC Scotland rugby commentator Bill Johnstone said it was a pleasure to have witnessed Lomu in action. "When you saw the players on the pitch, this man stood out because he was a veritable giant," he said. "He was a huge man, but he also had the pace of a sprinter and, when he got half a chance, with his bulk and the acceleration he was able to produce, he was virtually unstoppable and scored some marvellous tries, sadly some of them against Scotland. "Of course, you could only applaud the excellence of the man. "He was a behemoth and he scored against Scotland in 1999 as well - the Rugby World Cup quarter-final at Murrayfield. "He was just such a powerful man with the ball in hand. He was virtually unstoppable and, in every sense of the phrase, he was a giant of rugby union." BBC Radio 5 live will have a special programme tonight - Jonah Lomu: The Man Who Changed Rugby, which can be heard from 21:00-22:30 GMT.